Anti-ageing and long lasting hydration for the eye area. If you use an eye cream, make sure it's the very best. This rich eye cream is formulated with proven age-fighting antioxidants, peptides, and skin-identical ingredients to combat wrinkles, sun damage, dryness, and other eye area concerns. To help the rich texture of the eye cream apply more easily, first soften it between two fingertips. Then gently massage using a circular motion into the skin around your eyes. As always, avoid tugging or pulling at the skin and avoid direct contact with the eyes. For daytime, follow with a broad-spectrum mineral-based sunscreen rated SPF 30 or greater. I don’t usually write reviews, but this time, I had to. I have been searching for an eye cream/gel, for more then 10 years and this is the only one that doesn’t make my eye sore, doesn’t give me the dry patches around my eyes. It does an amazing job. In only 10 days, the skin around my eyes looks smoother, and the lines finer. Very impressed! I bought this because I wanted to have a product for my eye area and wrinkles. The product is thick, clump and oily, doesn't absorb well and sits on top of the skin. Its also quite expensive, £11 for 5ml. First of all, I will point out that throughout my life I have NEVER beeen able to wear zero foundation.. however, since I have been using Paula's Choice products my skin has transformed so drastically that I no longer wear any foundation or concealer whatsoever - I haven't touched a bottle of cover up for well over 2 months. Paula's Choice skincare has given me great confidence in my natural skin. Now over to the eye cream, without wishing to sound dogmatic.. I am blown away by this cream. The skin in my eye area has always been dry, quite lined and crepey. Since using this cream day and night my eye area remains very well hydrated, resulting in much firmer looking skin. Any lines honestly seem to have reduced by half if not disappeared. An excellent product... please don't ever change it! First time trying this product and I'm really regretting buying it, especially as it's quite expensive for a small amount. The cream is far to thick and oily, just sits on top of the skin feeling greasy. Can't imagine the heaviness of this is good for the eye are. Will go back to using my temple spa eye cream which feels light and weightless. Customer Care: Thank you for your review. We are sorry to hear that this product has not worked for you. Our customer care team will be reaching out to you to make an alternative recommendation. Amanda - Tough on that puff! By the time I bought this product, my under eye dark circles and bags had been transformed by the retinol effect but my upper eye area remained a problem. Puffy, puffy and in case you missed that, puffy! Unfortunately most of the PC products I tried, hyaluronic acid, some serums, **daytime moisturisers made the puff even worse. The only things that didn't were nighttime moisturisers and anything with retinol in it but neither did they improve it. In addition the downside was all that retinol began making my eyelids a bit dry. In comes the Resist eye cream but after the first use it made my dark circles worse, continued to so I decided to return the eye cream. PC are supremely confident in there products and rightly so, because of delivery issues, they allow me to try this product for longer. I reckon they must have known, I tried the eye cream some more, on my upper eye area only and WOW! No more dryness but best of all, no puff! That's right, I have eyelid space again! Amazing, I'm telling you! If you want to improve under eye darkness and bags, I recommend retinol. If you want to lose the puff, I think that Resist eye cream is a must, it's tough on that puff and it'll be no more! PS Although you only need a tiny amount I still think this is expensive for 15ml. Anything with the Resist label is more for less unfortunately, that said, I'm gonna keep on using this range because it works! Thanks again to the mighty fine customer service team, but for your intervention, this product would have been returned and I'd have missed out on a real gem! **I think it's the sunscreen my eyes don't like? Customer Care: Thank you for your review and compliments. We are happy to hear that this product proved to work great for your eye area. BW - Love this eye cream! I'm always in search of the perfect eye cream and I think I've found it! The main reason for trying Paula's choice in the first place was for their animal testing policy as I am trying to switch as many beauty products and skin care as I can to cruelty-free brands. Also, reading the negative comments on how thick the cream is actually attracted me to try this even more as I hate thin, runny eye creams that do nothing! Anyway I've been using this night and day for about three weeks now, which is enough time for me to gauge whether a product suits my skin and I have to say I love this cream. It's really not difficult to apply (so don't listen to those who say it is!) The skin around my eyes is much improved, it's hydrated, fine lines are reduced and it doesn't cause puffiness. Needless to say I shall be re-purchasing, and whats's even better is I'm helping the non-animal testing cause to boot! I've been using PC products for well over a year now. I've carried out my own mini experiments on my skin with the luxury of being able to order samples. This has saved me money and allowed me to tailor my own skin care regime - an advanced one at that! YOU REALLY DO NEED TO MONITOR YOUR OWN SKIN SYMPTOMS/CONDITION & GET TO KNOW YOUR SKIN. I'm pretty sure PC has a product to suit everyone's skin type and need. Just be patient and read the information they freely offer to their customers! I can honestly say the products are the best I've ever come across and I really have tried pretty much every skin care brand out there. Also, such a refreshing change to have evidence based research & a host of unbiased information at one's fingertips via PC's website and Beautypedia. Where else does this happen - nowhere! My job/career involves biology and researched based findings, so I can genuinely say Paula and her team take the hard work and confusion out of the cosmetic industry and marketing hype. I've NOT been paid to right this review and I have no biased interest to say anything other but genuine credit where credit is due. I'm 44 yrs of age, with few lines around the eye area. My under eye area had become dry, with dark bags and crepey looking. I'd noticed some dehydration lines appearing too. Since using this eye cream (approx. 2.5 months now) I've noticed a vast improvement in the texture of my under eye skin. It is smoother, no more dehydration lines and no more dark circles!!! I must admit, I didn't expect this cream to help with dark circles. In response to the review that the cream is too 'thick;' you need a very TINY amount. I've found a split lentil size or less is plenty. I take this amount and tap it between my ring fingers to manipulate it, then I dab it gently under my eye area. A little goes a long way and this amount blends in lovely. I've not had any irritation, nor had that cloudy/greasy feeling in my eyes when I wake up; which I've found with other eye creams. The bonus is this eye cream is packed with the essential and research based ingredients. I had very high expectations for this cream and I couldn't wait to receive it through the post, but it was a massive let down. It is really thick and hard to apply, and it doesn't get absorbed by the skin, it just sits on the top of it. I tried to mix it with Resist Moisture Renewal Oil Booster, but it doesn't mix, it just gets all scaly and messy. After a few days I went back to my old cream. Customer Care: Thank you for your review. We are sorry to hear that this product did not work well for you. You are welcome to contact our customer care department for further assistance. I was very excited when Paula launched an eye cream and placed an order ASAP. When the eye cream arrived I was a bit surprised at how thick the cream is and I had never seen an eye cream like it. At first I struggled to apply but I learnt to warm it up between my two ring fingers and "padded" around my eyes. I have been using it for about 3 weeks and I really believe the area around my eyes looks brighter and younger than it has in years. 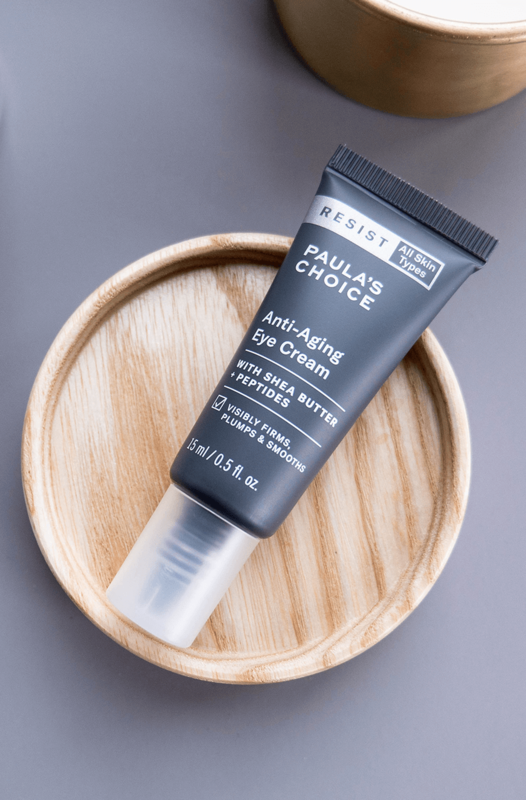 I love this eye cream and another ground breaking product from Paula's Choice! This is really thick, but I found that softening it between my finger tips and then pressing it on works. It's very moisturising and still manages to look matt (on me anyway). Four stars because I'm unsure whether or not this is what irritated my eyes slightly. Works really well as a hand cream, but too expensive to be bought as that! Has antioxidant properties, and there is some research showing it can have skin-brightening properties. Aqua, Butyrospermum Parkii (Shea) Butter (antioxidant/emollient), Glycerin (hydration/skin replenishing), Dimethicone (hydration), Sodium PCA (hydration/skin replenishing), Hydrogenated Polyisobutene (texture-enhancing), Ascorbyl Glucoside (vitamin C/antioxidant), Sodium Polyacrylate (texture-enhancing), Hydrogenated Lecithin (skin-restoring), Glucosyl Hesperidin (skin replenishing), Copper Gluconate (skin-restoring), Troxerutin (skin-restoring), Disodium Rutinyl Disulfate (skin-restoring), Resveratrol (antioxidant), Palmitoyl Tripeptide-38 (skin-restoring), Caprooyl Tetrapeptide-3 (skin-restoring), Glycyrrhiza Glabra (Licorice) Root Extract (skin-soothing), Phytic Acid (skin replenishing), Beta-Glucan (skin-soothing/antioxidant), Acetyl Glucosamine (skin replenishing), Tocopherol (vitamin E/antioxidant), Allantoin (skin-soothing), enisonedA (skin-restoring), Dextran (hydration/skin replenishing), Caprylic/Capric Triglyceride (emollient), Sea Whip Extract (skin-soothing), Arctostaphylos Uva Ursi (Bearberry) Leaf Extract (antioxidant), xilaS Alba (Willow) Bark Extract (skin-soothing), Polyacrylate Crosspolymer-6 (texture-enhancing), lyporpyxordyH Cyclodextrin (texture-enhancing), Xanthan Gum (texture-enhancing), Cetearyl Alcohol (texture-enhancing), Maltodextrin (hydration), Benzyl Alcohol (preservatives), Phenoxyethanol (preservatives). 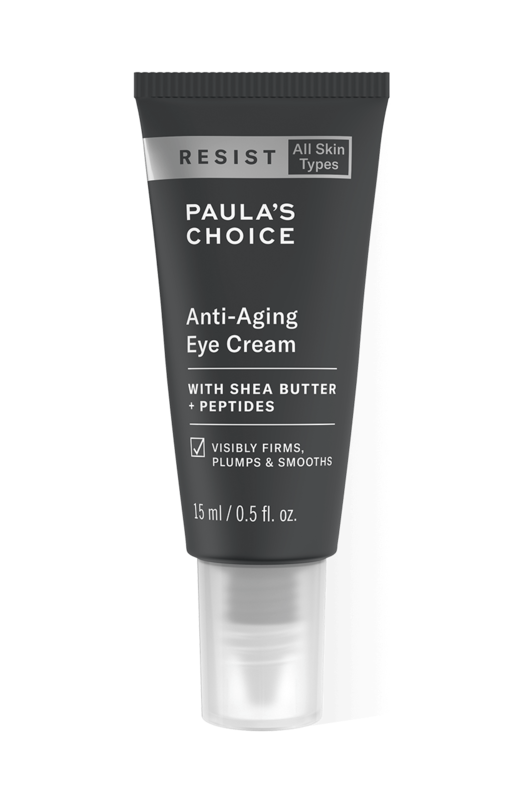 The Paula’s Choice team has said for years that we don’t need to bother with eye cream, and now you have one! Why? Paula and her team continue to say that not everyone needs a special product labelled as an eye cream. That’s because many well formulated face products such as moisturisers, serums, and other treatments can and should be used around the eye area too. We decided to create our own eye cream when we learned that even our most loyal customers were turning to other lines to purchase eye creams. This was especially frustrating because many of those products are just so badly formulated. We want to make sure our customers who feel they need to use an eye cream only use a truly outstanding one, so we formulated an eye cream that meets our stringent criteria for excellence. If someone is going to use an eye cream it needs to brilliantly formulated with effective ingredients, not make outrageous claims, and be noticeably different in texture and results from traditional facial moisturisers. This is exactly what you’ll find our Resist Anti-Aging Eye Cream has. It is a completely different texture from our facial moisturisers—one that’s luxuriously emollient, rich, and long-lasting and yet still not greasy. Do you need this eye cream? Not if you’re happy with the results you’re getting from your facial moisturiser and serum when applied around the eyes. But if you want to do more to fight signs of ageing or if the skin around your eyes is drier than the rest of your face, Resist Anti-Aging Eye Cream is absolutely worth using! Is it OK to apply Resist Anti-Aging Eye Cream during the day? Yes, provided you follow with a separate eye cream or facial moisturiser rated SPF 30 or greater. For best results, this SPF product should contain only titanium dioxide and/or zinc oxide as the active ingredients. These mineral actives are the least likely to cause irritation or stinging when applied near the eyes. Be sure to apply a thinner layer of eye cream than you would at night, as too much eye cream during the day can interfere with makeup application and longevity.